Encroachment in to access aisle – not a good idea. While disabled access laws prescribe literally hundreds of specifications, there is a shortlist of items that trigger the majority of lawsuits. A property owner or business can substantially reduce the chance of being sued by upgrading these items, often at minimum expense. There are a relatively small number of plaintiffs and lawyers bringing thousands of disabled access lawsuits in California. They are often referred to as “professional plaintiffs” because they make a living from bringing these lawsuits (I prefer the terms “trolls,” which is used in other areas of the law to describe such behavior, e.g., “patent trolls”). Disabled access laws in California are one of the few laws that award plaintiffs thousands of dollars without proving any actual monetary damages. Additionally, the law insulates the plaintiffs from risk by awarding atttorney fees only to prevailing plaintiffs. While these laws were intended to benefit real customers with disabilities who have difficulty accessing a business or other “public accommodation,” most plaintiffs appear to act simply as spotters who drive around looking for deviations from new construction access standards without any real intent to access the business or without suffering any real difficulty in accessing the business. In case the reference to “new construction” in the previous sentence leads anyone to believe that old construction is exempt from these lawsuits, please note that older properties (pre-1992), even historic properties are the most frequently sued. The access lawsuit trolls utilize a loophole in the law to apply “new construction standards” to old construction. Since old construction is the least likely to conform with new construction standards, professional plaintiffs have a virtual unlimited supply of defendants. Real acessibility, i.e., the ability of a disabled person to access the business has little to do with it. As for the term “public accommodation,” unless the property is exclusively a private residence (e.g. apartments with leasing offices may be vulnerable) or a business closed to customers (e.g., some manufacturers, distributors, etc. ), it is likely a public accommodation vulnerable to disabled access lawsuits. So what are these lawsuit bait items? 1) Disabled Access Parking: By far and away, non-conforming disabled access parking is the most common trigger for a lawsuit — not only the absence of such parking. 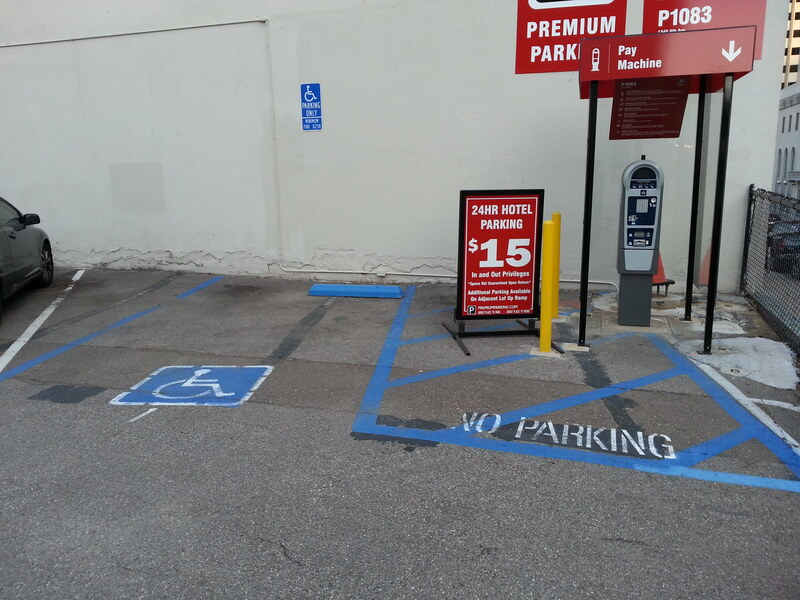 Disabled parking which is not in strict conformance with access standards attract lawsuits. Such things as slope, van accessible requirements, access aisle width, signage (color, words, height, etc. ), paint color and configuration, location of disabled parking, number of disabled spaces, and even faded paint or deteriorating asphalt are often grounds for a lawsuit. 2) Ramps and Curbcuts. Ramps, particularly the small ramps from the parking to the concrete pathway to the store or office, are one of the most common triggers for a lawsuit. For example, asphalt ramps from the parking to the curb generally do not conform to access standards. Among other things, such ramps often encroach into the disabled parking access aisle, which is not allowed. The correct way generally involves a curb-cut concrete ramp. However, there are many other requirements, including slope and landing, so it’s best to have a qualified professional install it. 3) Entrances. Entrances are another area a drive-by plaintiff trolling for lawsuits first looks. Door handles, kick plates, signage, width, opening pressure, and threshold height; entrance way access signage; and steps and slope – these are some of the issues easily spotted by a lawsuit troll. 4) Interior Aisles: Narrow or obstructed aisles, whether in a store or in a restaurant. Aisle requirements involve minimum widths, depending on the circumstances. 5) Bathrooms: There are a slew of requirments for bathrooms, many of them structural and expensive, others as simple as mirror height. Unless the business is required by law to have a bathroom for its customers, or if it would hurt business not to have a bathroom, many businesses choose to make bathrooms for employees only rather than incur the substantial expense of upgrading their bathrooms. While employee-only bathrooms must still comply with access requirements for disabled employees, this strategy removes bathrooms from the list of things a lawsuit troll can sue over. 6) Tables and Counters: Restaurants must make at least 5% of their seating accessible. Such 5% should be distributed in each distinct dining area, so that disabled person are not excluded from any particular area. Accessible seating involves numerous specifications for the tables and chairs but are not usually expensive (making an elevated dining area accessible, on the other hand, can be expensive but should not delay seating compliance in other dining areas). Counter requirements are not limited to restaurants, and include such things as display or cashier areas. Typically, counters that are too high are the issue. In sum, access lawsuit deterrence should start from the outside where drive-by lawsuit trolls can most easily spot vulnerability. Moreover, such outside sprucing-up should start with the parking, even if disabled parking already exists. After these exterior vulnerabilities are addressed, the interior should not be ignored, since many lawsuits start there too. Consider using a Certfied Access Specialist (CASP) to ensure optimimum access sconformity. By addressing the foregoing vulnerabilities, the chances of an access lawsuit will be greatly reduced. This entry was posted in Uncategorized and tagged accessibility, ADA, disabled access, troll. Bookmark the permalink.